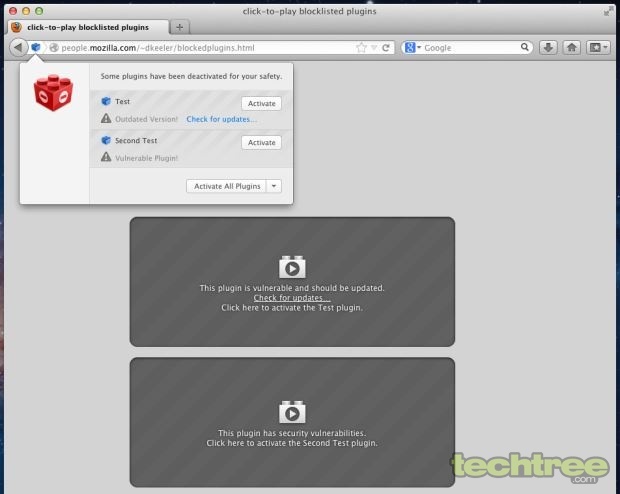 Will soon allow users to decide through a Click to Play feature; latest Adobe Flash is excluded from the blacklist. Firefox will soon introduce measures to control all third-party browser plugins such as Flash, Java, and Silverlight, for the sake of improving its performance and stability. The Mozilla Security Blog has reported that the browser will soon have a Click to Play feature to give users control of what add-ons are to be allowed. What this basically means is that the user will be able to install the plugins, and they will not run by default. Whenever website signals the requirement of an installed plugin, the Click to Play feature will kick in and prompt the user to give it a run. A warning will pop up to the user about the security vulnerabilities posed by the plugin. Incidentally, this feature has not been implemented for the latest version of Adobe Flash (above 10.2), but we can expect it to be covered in the future. Poorly designed third-party plugins are said to be a prime reason for Firefox crashes, leading to severely degraded user experience. Such add-ons may also pose a security risk for user data by installing malware. While the best way is to ensure that the plugins are updated as soon as the latest versions are available, there is still no fool-proof way to make sure that they will not crash the browser or degrade performance. Click to Play seems to be Mozilla's answer to these questions, although it seems more like handing over the driving wheel of an F1 racer to a rookie on a learning license. Nevertheless, we expect this will lead to less frequent crashes, something that has become far too frequent for the popular open source browser. The feature will be implemented via a browser update.